New Mexico. Salt Beds Could Become Nation's Nuclear Dump Underground salt beds near Carlsbad are being used to store nuclear waste from atomic weapons, and those federal shipments mean jobs and money. 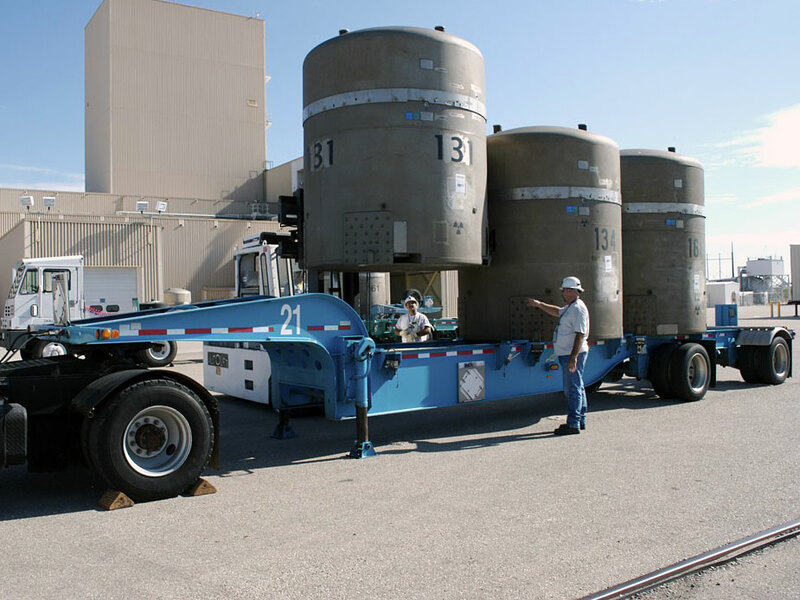 But the federal government still needs a place to store its most radioactive waste -- spent fuel from reactors -- and the Carlsbad salt beds are expected to be on the short list. The U.S. Department of Energy spends $235 million to run the Waste Isolation Pilot Plant in Carlsbad, N.M. And that investment means jobs. For 11 years, the federal government has been burying nuclear waste in New Mexican salt beds at a place called WIPP, or the Waste Isolation Pilot Plant. It's waste from making atomic weapons. But now the government is looking for a place to put thousands of tons of spent fuel from reactors. These salt beds could be the place. New Mexicans, however, are faced with the prospect of becoming the nation's default nuclear waste dump. The former mayor of Carlsbad, N.M., is solidly on the "yes, bring it on" side. Say the word "salt," and he grins. "The biggest asset we have are those salt beds out here east of town," says Bob Forrest, as he sips iced tea in the restaurant of the Stevens Hotel. "They've been out there 250 million years, and they've just proven perfect to put this kind of waste to store it permanently, and that's the key to our success." The U.S. Department of Energy spends $235 million to run WIPP, and a lot of that comes to Carlsbad. That means jobs -- about 1,400 of them -- from mining engineers to safety officers. A trip to WIPP starts with a safety video and a 26-mile drive outside of Carlsbad through the New Mexican desert. It's mining country with lots of small oil rigs and some potash mines still working. There's a big fence around WIPP, of course. Once inside, WIPP is a collection of big metal buildings and tall steel structures that lower and raise miners, equipment and salt through vertical shafts. I get suited up with a leather belt and an emergency air breather, a hard hat with a miner's lamp, and a matchbox-sized radiation monitor. Then, I climb into a 4-by-4-foot cage for a trip down into the mine with WIPP chief scientist Roger Nelson. 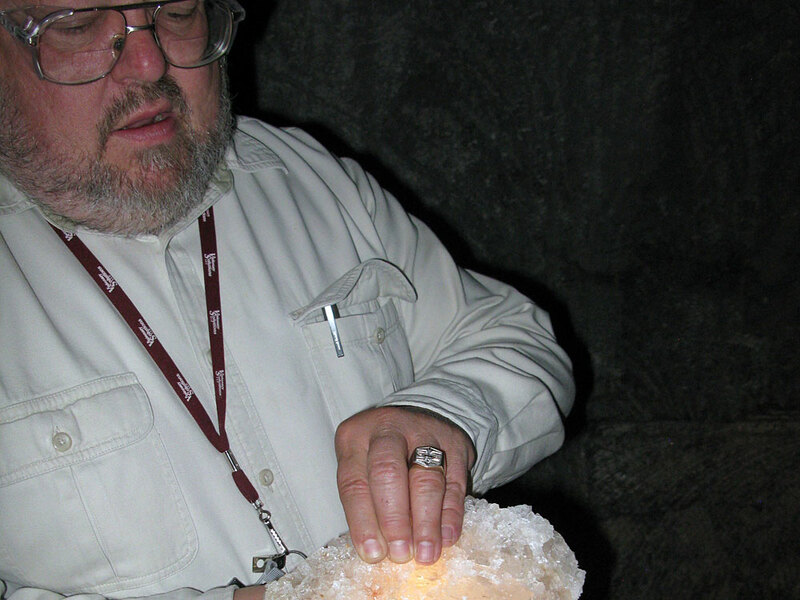 What we're plummeting down almost half a mile to see are caverns mined out of the salt beds. This is a good place for waste because the beds are dry -- there's no groundwater in them, although there's some water trapped inside individual crystals. Studies suggest that's not enough water to move the waste outside the salt bed. Nelson points out that what does move here are the walls and floors. "Salt at very high pressures, half a mile underground, behaves different than salt at the surface," says WIPP chief scientist Roger Nelson. "Salt moves like a viscous plastic or like cold molasses." 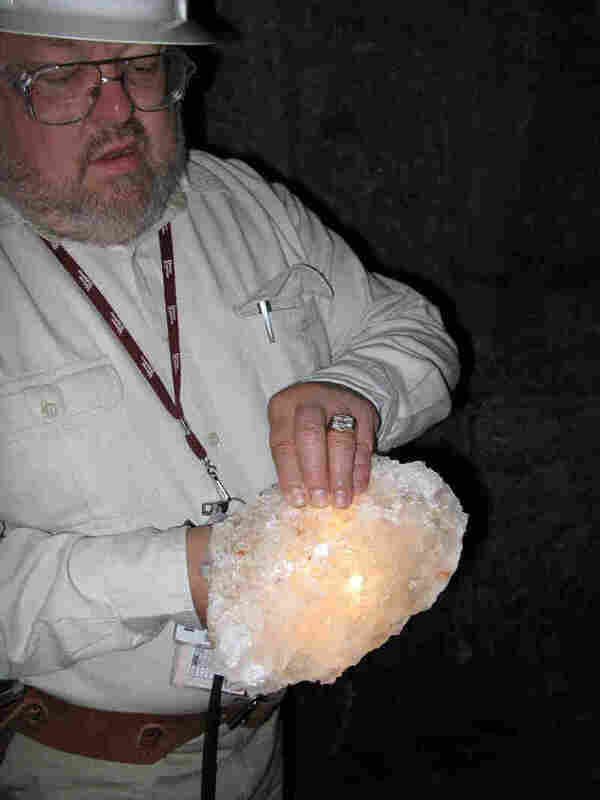 "Salt at very high pressures, half a mile underground, behaves different than salt at the surface," Nelson says. "Salt moves like a viscous plastic or like cold molasses." Over the next few decades, these caverns will slowly close up, like a healing wound. Once down in the mine, we climb into an electric cart. The tunnels are tall, wide and a sort of mottled off-white. Roof bolts and wire netting keep them secure. The wheels of the cart crunch over loose salt. We stop in front of a pair of giant doors, and Nelson has me pull a green cord hanging from the ceiling. With a whoosh of air, the doors open like a scene from an Indiana Jones movie. The doors are air-locked to control the flow of air through the maze of tunnels and caverns. Nelson says that what's buried here is mostly plutonium waste -- left over from making nuclear weapons -- solid chemicals, glove boxes and gloves, some dirt, and tools. It's trucked here from government sites around the country and stacked in cul-de-sacs in these caverns. Nelson points out a stack of steel drums, which contain waste, in a corner. "These are just normal 55-gallon drums, those green ones in the foreground," he says. Nelson says if you stood next to one of these drums for five hours, you'd probably get about as much radiation as you would in a chest X-ray. There is also a more radioactive class of military waste here. It's buried in the walls, secured with concrete plugs like a cork in a wine bottle. Once the repository is filled, nature will take its course, and the caverns will finally collapse. "All of the containers will slowly crush," Nelson says. "And then the salt will continue to fill in until basically it's an encapsulated layer about 10 feet thick with a thousand feet of salt above it and another thousand feet of rock above that, and several thousand feet of salt below it." Will It Take On A Bigger Job? So far, about 8,500 waste shipments have been trucked into WIPP and buried without serious incident. The state Environment Department says WIPP's safety record is good. And that's kept WIPP out of the newspapers. But not any more. That's because the federal government needs a place to dump thousands of tons of its most highly radioactive waste -- spent fuel from reactors -- someplace safe for tens of thousands of years. It was supposed to go into Yucca Mountain in Nevada, but that project has been canceled. Forrest says, why not WIPP? "It's just a no-brainer," he says. "Why would DOE [the Department of Energy] ever walk away from the most successful project they've got? I mean, they don't have a hell of a lot of great stories to tell, but this is the No. 1." President Obama has appointed a panel of experts to look for a high-level waste dump for spent fuel, and the salt beds are expected to be on its list. But despite Forrest's enthusiasm, there are also plenty of people here who say, "No thanks, we've done enough."